The "About ShellDispenser" window shows you information about your installed version of ShellDispenser. 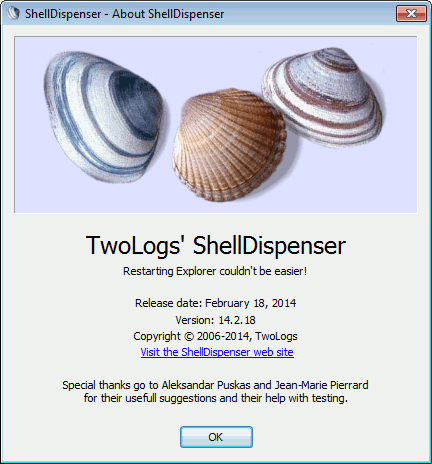 The latest version of ShellDispenser is available on the ShellDispenser website, which you can reach by clicking the link. More information on the latest and previous versions of ShellDispenser, as well as on how to stay updated with the latest version, can be found on the version history help page. The "About ShellDispenser" window can be accessed via the "Help \ About ShellDispenser..." menu item in the main window. Link "Visit the ShellDispenser web site"
Starts your web browser and opens the ShellDispenser website. Show the "About ShellDispenser" window help page.